Columbia, Mo. 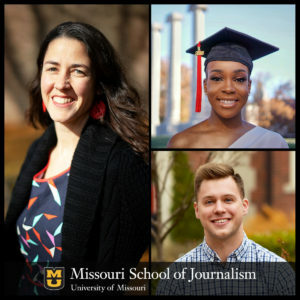 (Dec. 4, 2018) — The Missouri School of Journalism will recognize 126 students at the 1 p.m. commencement ceremony on Saturday, Dec. 15, in Jesse Auditorium. Seating is open, and no tickets are required. A link to a live stream of the ceremony will be available on the MU Graduation and Commencement page. Graduate degrees will be awarded to 3 doctoral candidates and 43 master’s students, 6 of whom earned their degree online. The 80 undergraduates are roughly split equally between studying some aspect of journalism and strategic communication. A total of 40 percent earned Latin honors by achieving at least a 3.5 grade point average. The alumna speaker will be Coburn Dukehart, MA ’03, the Digital and Multimedia director for the Wisconsin Center for Investigative Journalism. She joined the Center in 2016 after 16 years of distinguished work at national news organizations. Her role at the Center includes directing its visual strategy, creating visual and audio content, managing digital assets and training student and professional journalists. Dukehart previously was a senior photo editor at National Geographic, where she managed and wrote for the Proof blog, which showcased international documentary projects. From 2007 to 2013 she was the Picture and Multimedia editor at NPR – the first person in that role. Dukehart also has worked as a photo editor at USATODAY.com and washingtonpost.com, interned in the White House photo department and worked for a London-based international publishing group. Dukehart has received numerous multimedia awards from the National Press Photographers Association, Pictures of the Year International and the White House News Photographers Association. Her multimedia work also has been honored with a Webby, a Gracie, a Murrow and duPont awards, and she was nominated for a national Emmy. She earned a bachelor’s degree in journalism and English from the University of Wisconsin-Madison and a master’s degree in photojournalism from the University of Missouri. Evan Dodson will present the “Thoughts of the Class.” From the northwest Missouri community of Hale, he studied radio-television journalism and earned a minor in business. Dodson served on the Homecoming Steering Committee, was a Journalism Ambassador, participated in Mizzou Alternative Breaks, was a member of Delta Sigma Phi Fraternity and held several leadership positions as a member of Team Mizzou with MizzouRec. Dodson was a reporter and student anchor for KOMU-TV 8 News, mid-Missouri’s NBC affiliate. After graduation, Dodson plans to pursue a career in marketing and advertising in Kansas City. The master of ceremonies will be Obehi Imarenezor, of Chicago, who studied convergence journalism with an emphasis in television reporting. Imarenezor worked as an English-language reporter at the China Open during a study abroad experience in Beijing, China. She has anchored, reported, and produced for KOMU-TV, has served as an editorial/social media intern for VIBE Media, and has been an on-air personality on KCOU 88.1 FM‘s Real Talk Radio. Imarenezor is a member of the Delta Tau Chapter of Alpha Kappa Alpha Sorority Inc., the National Association of Black Journalists and the Radio Television Digital News Association. She plans to pursue business and entertainment journalism upon graduation. First of all, I’d like to say congratulations to my fellow graduates. Congratulations on making it through one of the most challenging and rigorous college degree programs out there. Many students who come here for journalism don’t make it to this moment. So, congrats on this accomplishment. Well, this is it. No more sitting in classes. No more late nights at Ellis. No more two-dollar Tuesdays. It’s bittersweet, for sure, but it’s time to walk out of Jesse and put everything this school has taught has to use. This place has turned us into writers, editors, designers and anchors. It’s made us reporters, account managers, public relations specialists and producers. It’s made us communicators, and it’s made us journalists. Love it or not, this school has given us skills that we wouldn’t have gotten anywhere else. And it’s helped us form a network found only on this campus. We’re finally part of this whole “Mizzou Mafia” thing, and we can finally call ourselves Mizzou alumni. We are about to go into a profession that’s changing and evolving so rapidly. We’re entering a world that needs strong journalists and strategic thinkers now more than ever. And the profession of journalism needs us. We wouldn’t be here without the help of our top-notch professors. Take a moment and think about all the professors you’ve had during your time on this campus, and all the things they taught you and how hard they pushed you to do better. Don’t get me wrong, there have been times where some professors have pushed us to what we thought could be our breaking points. But, at the end of the day, these professors have been mentors for us the last four years, and many of them will continue to be mentors throughout our lives. But the real heroes here are our parents. They’re the ones who have really held us together these last four years. They’re the reason we don’t have to eat ramen noodles or PB&J’s during the weekends or long breaks. And they’re the ones who listened to us and got us through the mental breakdowns at 11 p.m. about having three tests and two papers to write that week. They’re the reason we are in this room today, and they’re the reason we got this college experience. So, to all of the parents in the audience – thank you. Whether you’re excited or absolutely terrified to walk across this stage today, just know that you’re ready. You’re ready to go on and do bigger and better things. You’re ready to put the “Missouri Method” to the true test. And you’re ready to take on the real world. Thank you for the opportunity to speak today, and I wish the best of luck to the December class of 2018. Greetings everyone. I am so excited to be here. What an honor to be here with you on this special day. Professors, parents, siblings and friends, thank you for all the support you’ve given these graduates through the years. Since this is a community of storytellers and people who appreciate the fine art of a story, I’m going to tell you one of mine. It might seem like an odd tale – it’s not about journalism or strategic communication – but instead, it’s about following your heart and learning to be your best self. Both are things I wish I’d been able to do earlier in my life. But when I graduated from the University of Missouri in 2003, I hadn’t yet realized that following my own heart – being true to myself and celebrating those around me – might actually be the best way to be a journalist. That to empathize with others and to tell their stories, you need to be a fully present and whole human being yourself. For me, a generally stressed-out, A-type personality, that wasn’t an easy thing to do. After graduation I followed a fairly traditional path, until I finally decided to step off the career bus, stick out my thumb and hitch a ride on a different journey. And by letting go of what I thought I was “supposed-to-do,” I actually found a new way to be a citizen of my community, a wife, a mother, a journalist, a storyteller, a person who is whole. So here’s my tale, and I hope it can help you on your journey. This van has transformed the way my family moves and interacts with the world. It has changed us over time, and I now see it as a metaphor for my state of mind. The van has provided us freedom to camp with our daughters, spend hours on the side of the road picnicking, napping, hiking, and being in nature, and most of all being with our own thoughts and dreams and fears as we barrel down the road. The van has allowed us to meet people we never would in our day-to-day lives. Motorcycle riders who showed us their hand-carved hiking sticks and gifted us a preserved deer pelt in Custer State Park in South Dakota. Nebraska natives who pointed out every bird species that landed near our flooded campsite in the Badlands. And a fisherman who showed us a brook trout caught in Rocky Mountain National Park, its rainbow colors gleaming in the sun. When I first graduated from Mizzou I would have never imagined myself travelling in this van. Now I can’t imagine life without it. It has changed my outlook on life. At this point you should be wondering, as the trained skeptics that you are, “Why is she telling us about her family camper van? Why is she not talking about the lofty tenets of journalism such as truth and democracy and public-trust and accuracy? At least she should say something about fake news!” Well, since you are all graduates of the Missouri School of Journalism, I’m going to make an assumption you know those things already. That you are all ready to be bold and relentless storytellers. That you have been prepared to interview sources and write stories with clarity. That you can wield your cameras to make photojournalism that is compassionate and true. That you know how to record audio and video and edit the raw material into compelling stories. That you know how to deliver and distribute your messages in all forms of media. I know you can do these things because you are graduating from Mizzou. But, perhaps I can instill a dose of wonder and curiosity into your spirit as you embark on your journey. Perhaps I can encourage you to always follow your heart. Before this summer’s trip, my husband said he’d ordered a new bumper sticker for the van. I died a little inside, figuring it was probably another Grateful Dead decal. I took it in for a moment. Then he asked me: “What’s your first reaction? How does that make you feel?” He always tries to be so deep. It’s annoying. But it was a good question, so I answered. If I’m being totally honest, my real dream was to be a famous rock star. When my husband asked why I didn’t pursue that goal, I replied that I was too scared. It seemed impossible, so I never even tried. Maybe the real truth is that what I really wanted was to embody a famous rock star. I wanted to be carefree. I wanted to be brave. I wanted to be bold. I wanted to travel. I wanted to not follow a normal path. But I let my fears hold me back. When I started graduate school at Mizzou, I had practically no experience as a photographer. My portfolio consisted of a few amateur portraits and a picture of an abandoned car in the snow. My fellow photo students seemed more experienced, and in the first two weeks of school, doubt and fear began creeping in. As the classwork progressed throughout the semester and I further compared myself to my colleagues, the doubt and fear grew stronger. And later, when I was rejected from an internship at a prestigious newspaper, the doubt and fear became profound. I told myself I wasn’t good at journalism. I shouldn’t have even come to Mizzou. I thought I would never be a good photographer. At that point in my J-School career, I actually left Missouri for two years, before later returning to pursue a career as a photo editor. In my head that seemed safe. I wouldn’t have to go out into the field and talk to strangers. I wouldn’t have to carry heavy gear. I would have predictable hours. And most of all, I wouldn’t have to offer my creative work up for critique. I thought I wouldn’t have to face rejection. When I look back on that time, I see someone who was more motivated by the desire to be safe than with daring and drive. I wish I could take the wisdom of my 40-year-old self and tell that 23-year-old in the basement of Lee Hills Hall that it was OK to have doubt. That it was OK to be weird. That it was OK to be a professional journalist who was also an artist and a free spirit who embraced each opportunity with enthusiasm and excitement. I always wonder what would have happened if I had pushed past that first rejection letter. I wish I’d known that I would someday be the sort of person who takes vacations in a VW van. I wish I’d known more about who I wanted to be. Years into my career – after I’d reached what many might consider to be the pinnacle of a photo editor’s career – working at National Geographic! – with the help of my husband and a supportive family, I finally made what I feel was a bold and untraditional choice. I left behind prestige and professional name recognition for a job at an small investigative news non-profit in Madison, Wisconsin, where I am a photographer. Honestly, it’s been a relief to finally have made a choice that took me away from “supposed-to” into a space where I can finally start to become the person I had always wanted to be. And now, I have finally begun to let go of my fear and doubt and realize that I can actually do this journalism thing! That I can be vulnerable with my subjects, and give of myself, and gain their trust, and tell their stories in a meaningful and powerful way. I can now talk to strangers and carry heavy gear, and I’m having a ton of fun to boot. There are so many days at work now when I think I have the best job in the world, and I feel so grateful to be a journalist. So to you, graduates, as a favor to your future selves I ask of you now: Don’t put yourself in the position of remembering who you wanted to be, and instead work towards being that person right now. Question the idea of “supposed-to” so you can look back and say you lived life exactly how you wanted and are proud of who you became along the way. You may not be there yet. You may have pressures from yourself, from parents, from society to do things differently than what’s truly in your heart. And that’s OK. But put it in your pocket, sew it on your sleeve, buy it on a bumper sticker: Never stop remembering who you wanted to be. You can be that person right now.